You can rely on us to provide the concrete delivery solutions you require in Collingwood. Sometimes mixing your own concrete or transporting the materials you need just isn’t an option. At Flesherton Concrete Products, we understand that you may not always be able to pick up your required materials for a construction or building project in Collingwood, Ontario. 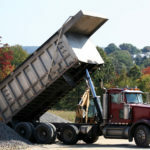 Whether you need a high volume of supplies or you are working on a small project but don’t have the ability to transport your aggregate products, you can rely on us to provide the concrete delivery solutions you require. Quality Products – The results of your project rely upon your ability to access quality products and materials. Whether you require concrete delivery for pouring or you are using recycled concrete for a paving project, you won’t be disappointed with the materials that we supply. Timely Delivery – At Flesherton Concrete Products, we understand that your project is most likely on a timeline. As part of our commitment to service, we promise timely concrete delivery, so your project stays on-schedule. Competitive Pricing – Just because we offer high-quality materials and honest services doesn’t mean that we won’t offer you competitive prices. Part of what makes us your top concrete delivery service is that we can provide the services and solutions you need within your budget. If you have questions about our products and services, or if you would like to schedule concrete delivery in Collingwood, contact us at Flesherton Concrete Products today for more information. We are a family-owned and operated business with over 30 years of experience in the concrete industry. We look forward to meeting your needs.